Quality control for safer cycling: Each tube is checked twice at the factory to ensure safer cycling. I have used Conti's inner tube before, and switched to Schwalbe's for a while after I run out of the old tubes. 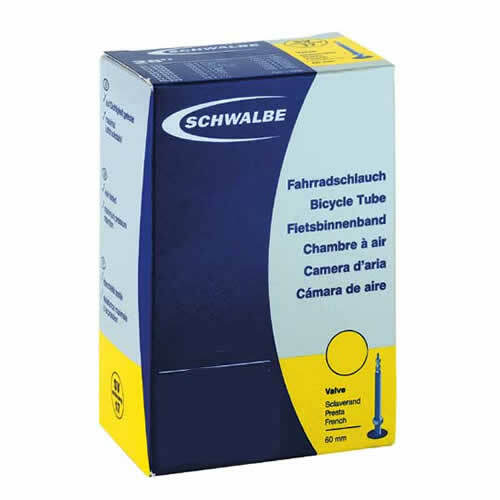 I found Schwalbe's to be ways better! It fits perfectly on my tire (Conti GP 4000s II) while the conti's inner tube itself is slightly longer, thus risk folding inside. It also has not given me valve leak which I had a few times with Conti's. Never had a problem with these tubes. Really a high quality inner tube, long valve match 30mm RIM really good. Great tubes always hold pressure for a good amount of time. Quality product, as I've got used to from Schwalbe. Can't comment on longevity yet but so far so good. Excellent value no problems yet. Durability 3/5 Weight 3/5 Cost performance 4/5 Is 18-28, but easy-to-use performance, do not change so many tires. When the purpose of the race, the reader is encouraged to buy the item lighter. If you normally use, cost performance is very good.